As October 17th is the official Okinawa Soba Day, I decided to try making Okinawa soba myself by hand. I headed down to Nishizaki, Itoman, in southern Okinawa to attend a class at Sun Sun Kitchen, a cookery school managed by the Sun Foods Company. It is believed that this dish was created around 480 years ago and began as a soup used as an offering on the 49th day of the Buddhist memorial service for Sho Shin, a king of the Ryukyu Kingdom. Japanese soba, generally referred to as “soba,” is a type of noodle made from buckwheat flour. 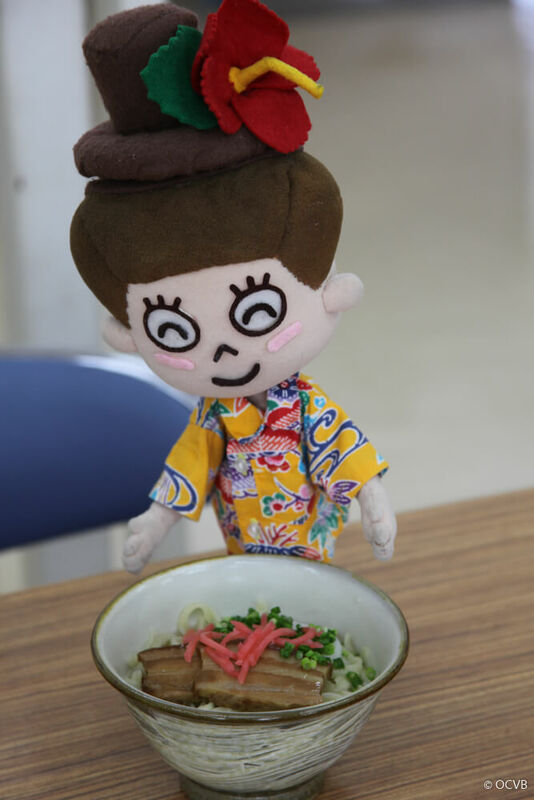 However, Okinawa soba does not use buckwheat flour and instead is known for being made with all purpose flour. In the past, the charcoal left over from the burnt wood of trees such as Bishop wood and Chinese banyan was used to make this dish. Nowadays, though, it is often made with lye water. 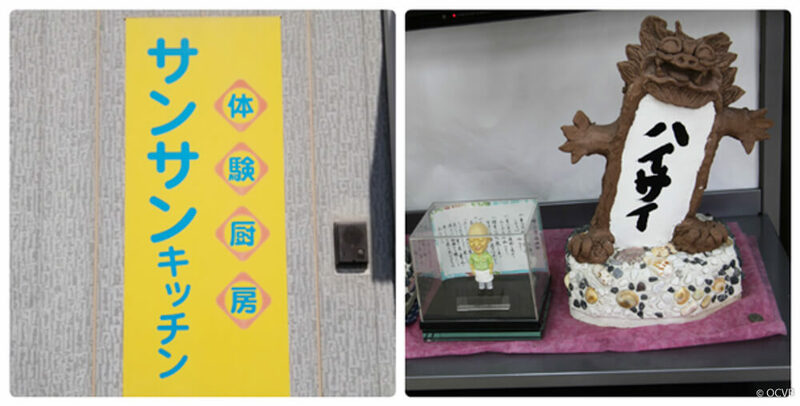 What is “Okinawa Soba Day”? How to make Okinawa soba. 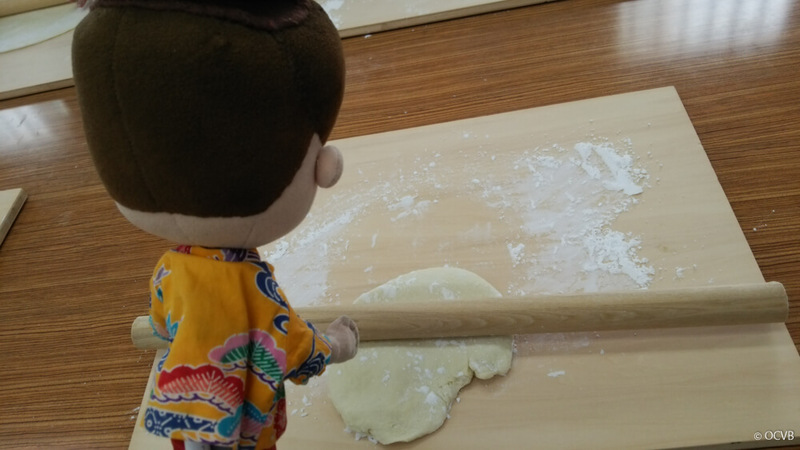 First, the teacher started by showing us where we would be making the soba. “● Heres an easy-to-follow recipe. 1. Mix powdered lye water with water and salt. 2. Sieve the all purpose flour. 3. Mix the flour (2) with the water mixture (1). 4. 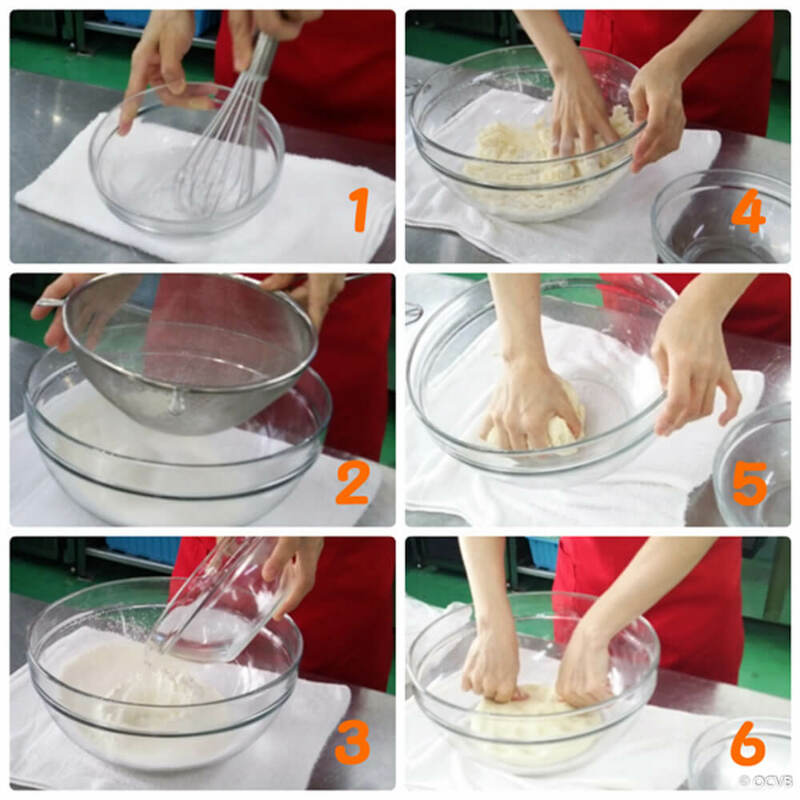 Mix until you start to form a large ball of dough. 6. 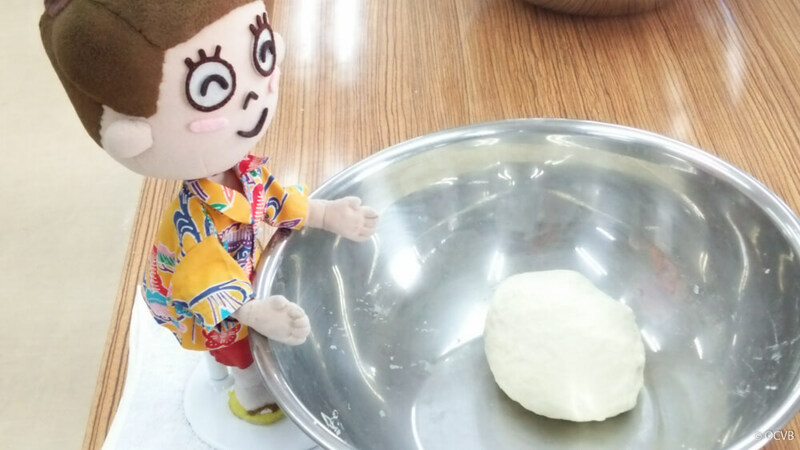 Flatten the dough and make sure there are no air bubbles. Then leave the dough to prove for 30-40 minutes! Kneading the dough is really difficult, but so much fun! While waiting for the dough to prove, I had a look around the factory! 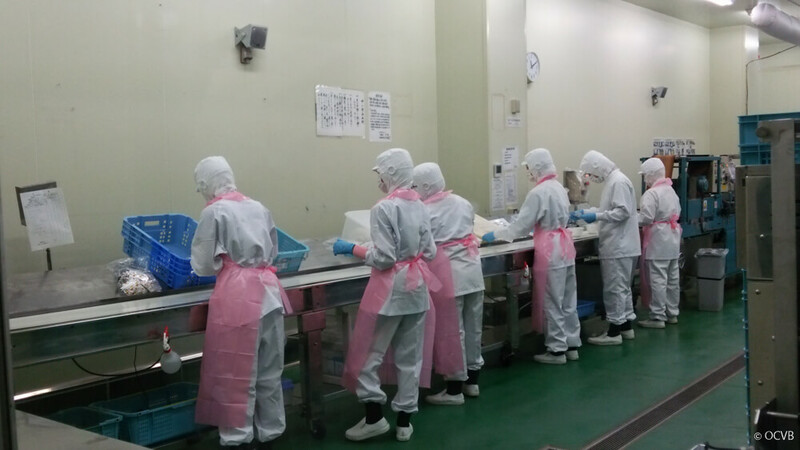 As well as making the cups of instant Okinawa soba sold in the supermarkets, they also customize the thickness and flavor of the noodles for specialty stores around the island. Now it’s time to head back to the kitchen and get back to work! 7. Dust a chopping board with flour and roll out the dough (1.5 — 1.7mm thick). 8. Fold over the rolled out dough. 9. Cut the dough into strips 3mm wide. 10. Shake off any flour stuck to the noodles. 11. Squeeze the noodles firmly to crimp them. 12. Boil the noodles for 1 minute. 13. Cover the noodles in salad oil and cool in the refrigerator. 14. Pour some soup into a bowl and top with the noodles. Mahae gives it a shot! Add some meat, spring onions, and ginger to complete the dish! 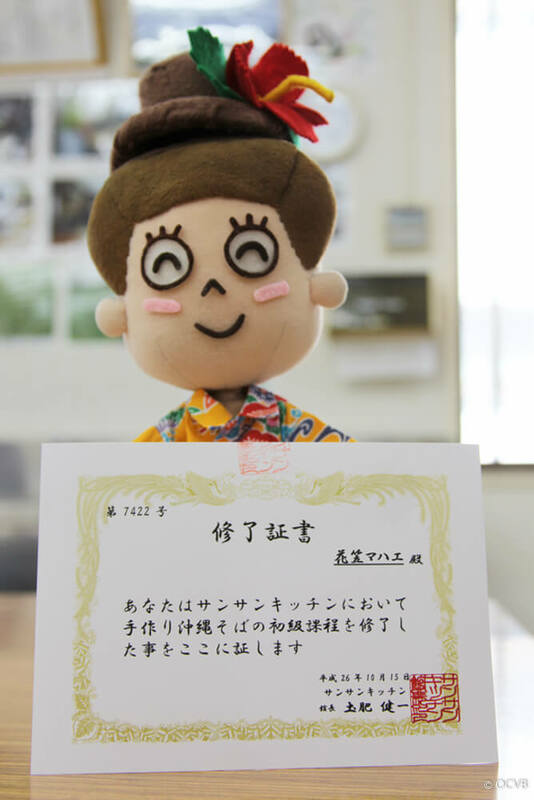 Thanks to the teacher’s guidance, I was able to finish making the noodles without any problems and even received a certificate! Thank you for teaching me how to make Okinawa soba. 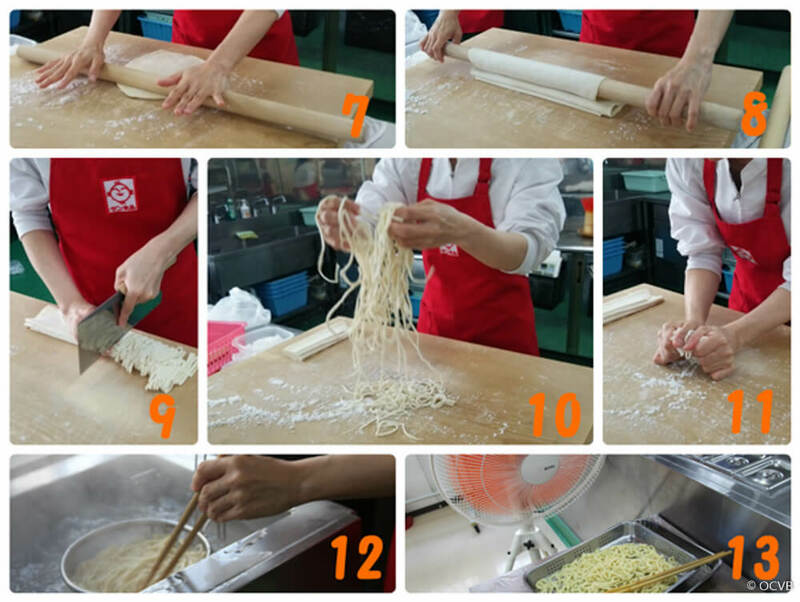 ※ Advanced reservation is required for the soba making class. ※ Soba making classes are taught in Japanese, so reservations can only be made if an English interpreter attends the class.